So - this is a short review as Mammy MakeUpForDolls believes in brevity :-) Here's what she told me: "I absolutely love this product, it's hands down the best moisturiser I've ever used, and my skin is amazing, the best it's ever been". She won't mind me advertising her age, as she blogged before and mentioned it, and it's relevant here - she's 64. She's blessed with great genes and looks and acts far younger than her age. That said, here's what I've observed: her skin is positively glowing, radiant and extremely young looking of late, and this is after a good summer in which she abused the sun and didn't use nearly enough SPF (don't get me started on that). Some of her finer lines are completely gone. Some of her deeper ones are very softened. And her pores are diminished. All this after only couple of months (morning and night) usage. And I wasn't the only one to notice this either - several people, apropos to nothing, mentioned this to me and to her of late. 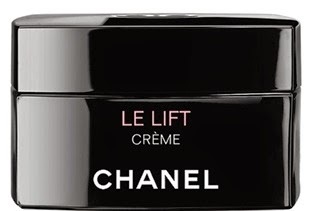 I wasn't aware she'd started using the Le Lift, but she told me that she had, and then, and added in some gushing (brief gushing, but gushing nonetheless) for good measure, about how it feels (amazing), how it smells (divine), how it applies (beautifully), what it does for her skin (magic). Incidentally, she's got very normal skin and is using the Creme (there are three varieties for different skintypes). I don't have a back-of-hand splodge to share with you, as it's gone around the world with Mammy MakeUpForDolls on her latest adventure). I can tell you from my own usage that this one (Creme) is a standard light-cream texture. The Creme Fine is more of a fluid lotion-based cream, and the Creme Riche is thicker than the Creme). 107 of your hard-earned bucks will buy you 50g of this cream, not cheap but by no means the most expensive moisturiser available. Although Mammy MakeUpForDolls nearly had a coronary when I mentioned the price to her, I did point out that this 50g should last her about six months if she uses it as both her day and night cream (in other words, about a year if she uses it for just one of the two - it's intended to be used for both, and that's how she uses it), and stops slapping half of the jar all over her face like a cheap cold cream (don't get me started on that either). Look here for more information on this product (my preview post) and here (Chanel site). Highly highly recommended for more mature skin.